all AXV300 Modules Need A 24 VDC Supply Voltage To Power The Regulation Card/internal Logic And Fans. The Line Of AXV300 Modular Drives Is The Result Of The Experience Gained By Gefran In Over 30 Years Of Working In Close Partnership With The Leading Industrial Automation Manufacturers. 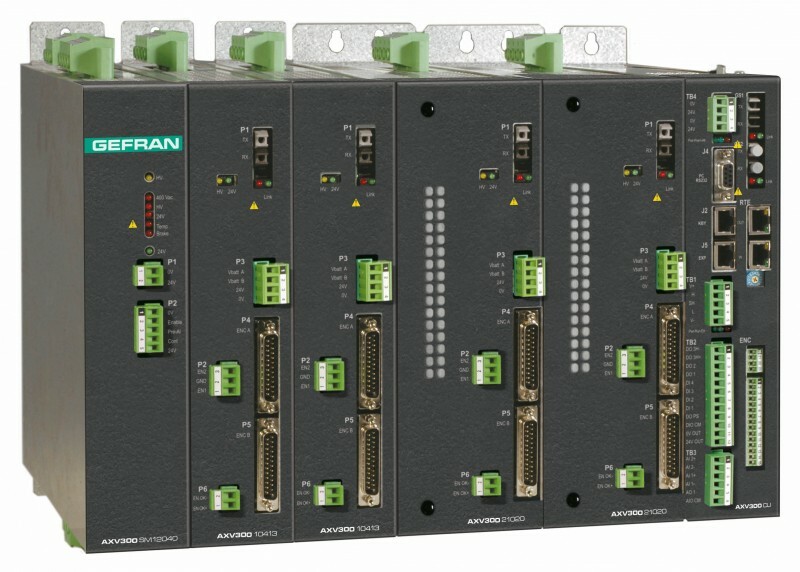 Powering Each “multi-axis” System By Means Of “common DC Bus” Ensures The Gefran Clean Power Formula Thanks To The Standard Use Of Active Front End Technology, Which Further Increases Dynamic Performance And At The Same Time Guarantees Energy Efficiency By Regenerating To The Grid And Avoiding Unnecessary Waste On Brake Resistance. The Structurally Excellent Range Of Modular Axes Includes A Wide Choice Of Power Combinations For Up To A Total Of 120 KW. It Offers 7 Mechanical Sizes With Rated Currents Of 5 A To 200 A For Motor Modules As Well As Regenerative Or AC/DC Power Supply Modules. The AXV300 Implements Advanced Application Solutions Based On Positioning And Interpolation, Structured In IEC 61131-3 Programming Environments. Communication Via Ethernet Or CAN Bus Enables Total Integration Into The Most Commonly-used PLC System Architectures.